Located on Gore Avenue between Lockwood and the railroad tracks in historic Old Webster. Take Hwy 44 west to the Elm exit. Turn right on Elm, one mile to Lockwood. Turn left on Lockwood to the stop sign at Gore. Turn right 4 doors down to 19 N. Gore Ave.
Take Brentwood Blvd. 2 miles south past Manchester to Gore, turn left. We’ll be on your right a few doors past the railroad tracks. After 22 years in St. Louis’ Central West End and 10 years at the corner of Lockwood and Summit, We’ve moved once again to our spacious new 3 story building in the historic Old Webster neighborhood. 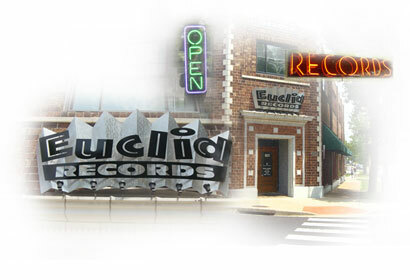 Euclid Records St. Louis is now a sprawling 8,000 square feet of new and used CD’s, vinyl, DVD’s, books and accessories. In 2010 we opened our second location in New Orleans, Louisiana, proudly serving up records in the 9th ward, the Bywater neighborhood to be exact. Euclid Records has been doing worldwide mail order since the mid-1980’s and maintaining our website since 1991. Come and visit our website or the store, look around and stay awhile. We invite everyone to come often, new arrivals come in weekly, to find all of the rare vinyl, CD’s and other music collectables you may be searching for. We also have a comprehensive stock of rarities on our eBay store, user name euclidrecords. We make sure that the quality of titles, pricing and grading are maintained to a high level. We hope your experience with Euclid Records will be gratifying, and that we can continue a great working relationship in the future..